A death can be a victory. Jesus’ death is presented as his glorification or enthronement in the Bible. Here, one of Jesus’ disciples dies in a way that is just like him. He faithfully stands for what is true and is released through death into the arms of his saviour who waits for him. The Holy Spirit fills disciples in Acts and gives them their strength and insight. Those who oppose the gospel are infuriated with such a passion that we are left with a clear insight that they are corrupted by evil. As Jesus put it, they have the devil as their father, not Abraham. Saul (Paul) is listed among the opposition to the gospel. He is aligned with evil. This shows that even the cruelest heart can be captured by God. 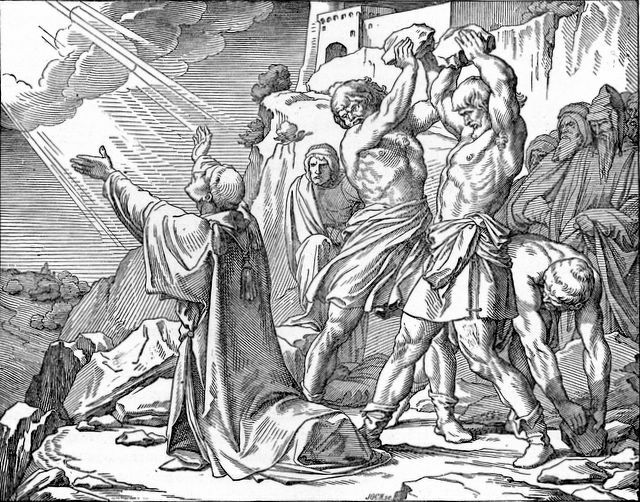 Maybe the stoning of Stephen left some affect on Saul, but if it did he suppressed it. God answered Stephen’s prayer at his death and did not hold this great sin against him. The last line of the stoning is one of peace. Stephen is not burdened and driven in the way that Saul was. He lacks the fury and disquiet of spirit of his opponents. He ends his life eloquently, powerfully and peacefully. We are encouraged to be filled continuously with the Holy Spirit. We, too, can have eloquence, power, and peace in the face of great trials. This is beyond our natural powers because evil affects us and works against us from within and without. Isis is killing Christians in Syria and Iraq at the moment. The beheadings of adults and children are horrifying. I inadvertantly came across pictures on line and was shaken to think that many of these people were killed for believing the same things as me. I hope that God was powerfully revealed in them at their ending. Those who oppose Christianity with such passion show by their passion that God really exists. Their anger and fury does not make sense if God just doesn’t exist. Of course, some ideas about God are really harmful. Isis kills in the name of God. However, many atheists oppose the idea of a peaceful and kind God with much the same fervour as they do an angry and vengeful God. In the face of rejection and suffering the Holy Spirit can empower us and bring Jesus near. We have to redouble our commitment to live close to him. Holy Spirit, as Kelli and I write our book I feel less organised and structured. I let these feelings become reality and I walk less powerfully in the principles that I hold as true. Let me stick to the core of my beliefs in thick and thin like Stephen did. What had Stephen told the Sanhedrin that made them mad? How is Stephen an example to follow? How are Christians persecuted in the west? How can they stand? How are we to support Christians killed by radical Islam and other haters?